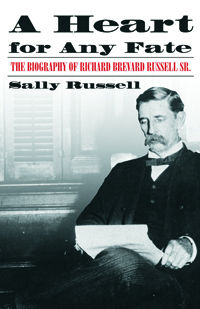 Mercer University Press: A Heart for Any Fate : The Biography of Richard Brevard Russell, Sr.
Born in 1861, eldest in a while, middle-class Southern family that lost everything material in the American Civil War, Richard Russell grew up consumed with ambition to make a name for himself. His dream was to found an outstanding family and to hold the three highest offices in Georgia: chief justice of the Supreme Court, governor, and United States senator. In striving for these ambitions, he married twice and ran for public office seventeen times. Although elected to lesser offices, he lost races for chief justice, governor, Congress, and the US Senate. He was elected to the first Georgia Court of Appeals in 1906 and to the Supreme Court as chief justice in 1922. His first wife, Minnie Tyler, died in childbirth in 1886, leaving him bereft, but five years later he married again. With Ina Dillard he formed an exemplary marriage relationship that produced fifteen children, thirteen of whom survived to become responsible adults, credits to effective parenting. The eldest son, Richard Brevard Russell Jr., fulfilled the gubernatorial and senatorial dreams of his father, becoming governor of Georgia in 1931 and US senator from Georgia in 1933, when he was thirty-five years old. He served thirty-seven years in the United States Senate and became Georgia's premier statesman of the twentieth century. Thanks to their father's emphasis on education and his willingness to pay for it, the Russell children studied law, medicine, the ministry and teaching and became respected professionals in their careers. The glory and difficulty of patriarchy come clear in this story of social and familial structures that both restricted and strengthened conscientious middle and upper-class white men of the post-Civil War South.